On The day that Acura announces its return to sports car racing, in the 2007 ALMS, Martin Spetz forwards these two images from a previous IMSA / Acura era. 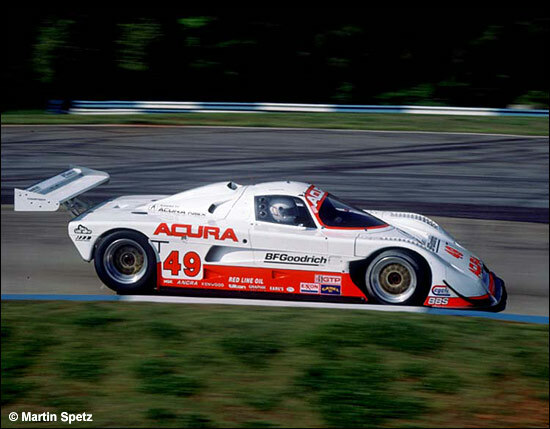 The first image is of the Parker Johnstone / Dan Marvin Acura Spice at Road Atlanta in April 1992, when the car sat on the IMSA Lights pole, set the fastest race lap, and won the class – ahead of the Scandia Buick Kudzus of Andy Evans / Fermin Velez and Tommy Riggins / Charles Morgan. In 1991, Parker Johnstone had taken class honours at the end of the season – in fact three races before the end. 1992 saw him triumph again, but by a much smaller margin. The CompTech BF Goodrich Acura team had started ’92 with a class win at the Rolex 24, then won three of the next four, including the aforementioned Road Atlanta, but the second half of the season was hotly contested, with the Scandia cars taking two 1-2s. The Acuras came back with wins at Watkins Glen and Laguna Seca (none other than Wayne Taylor sharing the win), with Johnstone and Marvin taking honours at Portland at Phoenix – and finishing up with second at Del Mar, to take the crown. Johnstone secured the pole at every race, and Acura won the manufacturers’ title by just six points, from Buick. So that was 1992 – and 15 years later, the Acura name will be back. 1993 wasn’t a classic season, although it did introduce the WSCs (and the Ferrari 333SP), and there has been a natural evolution from that point to the LMP1s and 2s of the modern era. The IMSA name died with the GTPs, but even that has returned. 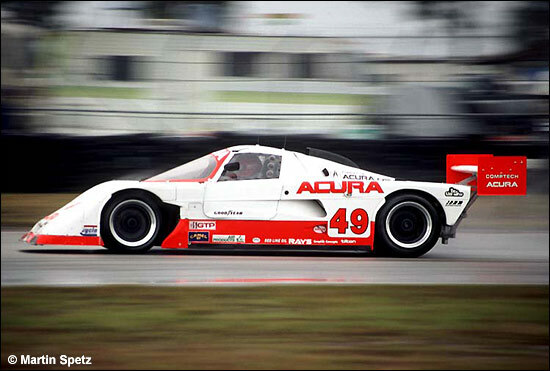 Martin Spetz’s second image shows the winning Acura Spice at Sebring in 1993, driven by Johnstone, Marvin and Melgrati. Johnstone and Marvin won almost everything that year – and here we are looking at the return of Acura in less than 12 months’ time. Jon Field must be rubbing his hands with glee at the opportunity to take another manufacturer scalp!